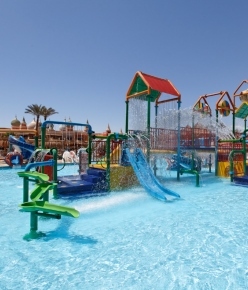 There’s no better way to entertain a family on a hot summer day than at the spectacular water park where you are guaranteed a fun-packed day for everyone. 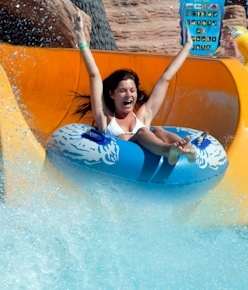 The huge water paradise offers 62 water slides and games. All this entertainment will give you and your family a wildly wet and fabulous fun filled holiday. So what are you waiting for... come and jump in! 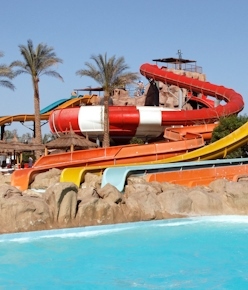 Hold on to your heart as you race down this monster, high-speed "free-fall" slide with 50.95 m length and 11.55 m height. As the name suggests, features two enclosed slides that catapult riders into pitch black spirals of darkness. You don't know which way you're turning next, and you don't see a thing until you hit the final splashdown! Amusing water game with 106.16 m length and 11.55 m height for adults only! Get ready for the thrill of a lifetime on the 112.74 m long and 11.55 m high slide! For adults only! Watch the smiles on your kids' faces as they enjoy the interactive fun. 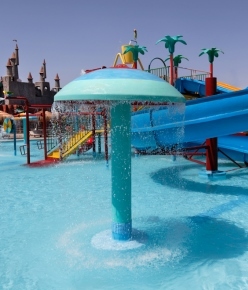 A zero-depth pool with a water mushroom provides refreshment when it's time to cool off (for children between 4 and 6 years).